Wow, lots happening today! Early morning at Long Nab a Snow Bunting flew south and several Redwings and Fieldfares arrived from the east. Other highlights through the day from there were 41 Dark-bellied Brent Geese, a Long-tailed Duck, 26 Eiders, 59 Red-throated Divers, 1 Great Northern Diver, a Manx Shearwater, 14 Little Gulls and a Mediterranean Gull. 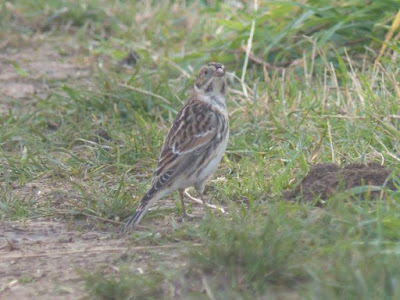 A Whimbrel remained feeding in the fields, and a Lapland Bunting was feeding on the Cleveland Way 50m south of the observation hut. Away from Long Nab, 3 Goosander were seen going south and a Short-eared Owl was moving south along the cliffs above Marine Drive. A Great White Egret was spotted this morning on the pond on Stone Quarry Road, Burniston, then later flying over Cloughton. A Green Sandpiper flew west over the A64/River Hertford intersection. 54 Teal flew east over Selley Bridge Farm, where there were also 150+ Golden Plover, a Barn Owl and a Water Rail. A Water Rail was also seen at the south end of Scarborough Mere, along with 3 Goldeneye. Flotmanby Carrs had 11 Whooper Swans and Burton Riggs had 2 Barnacle Geese. This afternoon there were 41 Turnstone and 20 Purple Sandpipers roosting in the harbour, plus 2 more of the latter in North Bay. Scalby Mills hosted a count of 105 Wigeon, 450 Herring Gulls, 35 Great Black-backed Gulls, 60 Black-headed Gulls and a Mediterranean Gull. Phew!